They are the rare breed in the NCAA and NHL world. And they don't get to that lofty perch by accident. Boston University coach Jack Parker and strength-and-conditioning guru Mike Boyle took about 175 hundred pounds of skin and bones and began molding Washington Capitals defenseman Tom Poti into one of college hockey's top offensive defensemen. "Poti was a tall, lanky guy with all kinds of puck skills and a real knowledge of the game," Parker said of the Worcester, Mass., native and Cushing Academy standout. "If we could get him to BU, we could do a lot with him off the ice with Mike Boyle." "I was a skinny kid," Poti agreed. "I knew that working with Mike I could put on the weight to ultimately get to the NHL some day. With Jack, you see the guys he's turned pro and how many went on to the NHL from BU, that was a big selling point for me." Reaching those goals, however, had one other serious impediment. "He not only had the weight problem," Parker recalled, "but he had that because of the nutrition problem and his food allergies. So we did a lot of work with that and got a lot of people involved with that. It worked out real well for him." "From the get-go," Parker said of Poti's freshman year, "when a guy gets that much ice time killing penalties and playing on the power play, he automatically becomes somewhat of a leader. 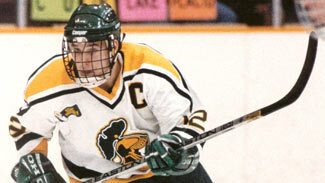 Even as a freshman, he was arguably the best defenseman in the nation. And then he had a spectacular sophomore year." "My first year, I was kind of feeling my way around," Poti said. "I didn't want to do too much. Wanted to show coach I could play defense as well. The second year I concentrated more on offense and did some good things." Good things like doubling his points from 21 in 1996-97 to 42 in 38 games that sophomore season. Good things like leading the Terriers to Beanpot titles in 1997 and 1998, and being named Beanpot MVP in '98 in the Terriers' 2-1 overtime win against Harvard; Poti assisted on both goals. "It was awesome," Poti said of the prestigious tournament. "Growing up, it was one of the few college games I'd watch. The first two Mondays of each February was just a special tournament to watch as an 8- or 9-year-old kid just wanting to be a part of that some day. To win two and get an MVP was pretty special." He did other good things, like leading the Terriers -- along with Chris Drury -- to the NCAA Tournament both years, and coming within a period of winning a national title in 1997. "My freshman year, we weren't supposed to beat Michigan (in the NCAA semifinal), they were the cream of the crop," Poti said. "We went in with a game plan, stuck to it and weathered the storm, played a great game. I think against North Dakota (in the title game) we might have run out of gas. We had them a couple of goals, but fell apart at the end (6-4 loss). The year after that was a tough loss to New Hampshire (4-3 in OT). Would have been nice to play here (in Boston) in that final four. "I had two big assists against Michigan in that '97 semifinal game," he said in reflecting on some other memorable points of his college career. "Those two I look back upon. One was a good pass to Drury down low for the game-winning goal." All good things -- in college, that is -- may come to an end, as the bigger stage awaited Poti's arrival. "He obviously was ready to go to the NHL," Parker said of Poti, who Edmonton had taken with the No. 56 pick of the 1996 Entry Draft. "It was one of the toughest decisions of my life," Poti said of leaving BU after his sophomore year. "Money never really had a big part in it. It was my dream to play in the NHL. Me and my dad and my mom and coach Parker kind of sat through the whole process with a bunch of meetings to keep all of us in the loop. I just felt it was time to go. I had a good chance of making the club in Edmonton. I thought was ready to battle the long pro schedule." "I think he ranks among the top five (defensemen) in BU history, up there with Peter Brown and Matt Gilroy," Parker said. "We had Vic Stanfield in the '70s with 60 assists. Tommy gave us a presence out there -- very much a cache and cool." Poti unleashed his cache of smooth skating, slick hands, puck-handling proclivities and an eye for the net at BU -- and on the NHL stage the past 11 seasons with the Oilers, Rangers, Islanders, and now Capitals, where he is in the third year of a four-year deal. Poti's best season was 2003-04, when he posted 48 points in 80 games with the Rangers. This season, he has 21 points in 51 games. How does Poti summarize his successful NHL career, which includes 66 goals and 315 points in 768 games? "Early on I was looked at as the offensive guy, played a lot on the power play to put up a lot of numbers," he said. "The last two or three years, I've been concentrating more on defense and penalty kill. It's nice to contribute in all aspects. "My game has done a little bit of a 180. I learned a lot about that under coach Parker. He always stressed defense and taught me, 'I know you can score and do things offensively, but when you concentrate on defense, that will ultimately keep you in the NHL for a long time.'" What connects Poti to BU now? "When you pull on that BU sweater, you're connected to all the guys past and current and future Terriers. It's a great bond. I'm still close with Chris Drury and Mike Grier. It's a fraternity." "I think we have a special team with (Alex) Ovechkin," Poti said. "It's like playing with Brian Leetch and Eric Lindros and (Mark) Messier. We're in first place in the League, and I think we can go the distance this year." Poti will turn 33 in March, but he's not looking that far into the future. "Getting up there," he said, "but I try not to think about (retirement) turning 33 next month. I've played 12 years in the League now and still just enjoying it having fun being out there with the guys. I just want to ride out the storm as long as I can." He'll do so on that 6-foot-3, 197-pound chiseled frame, built at BU.